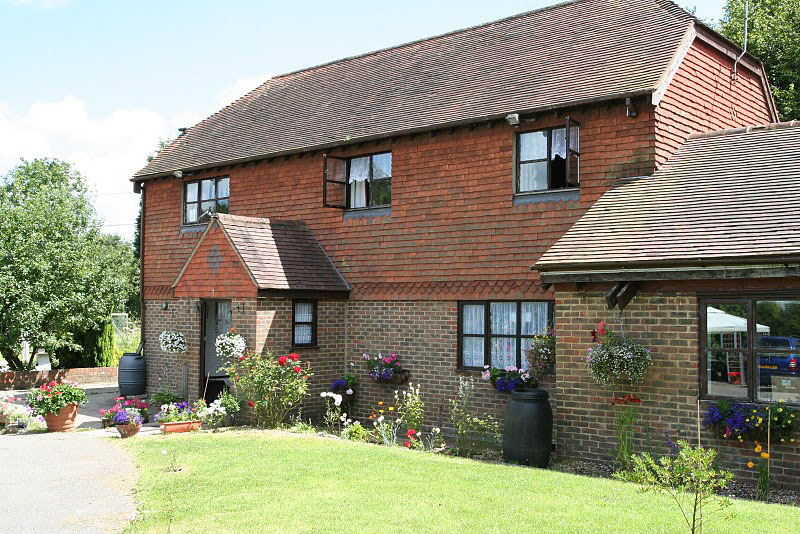 Our history started in 2006 with the acquisition of a family owned property called "Rocks Farm" near Bodiam in East Sussex, with the aim of establishing a convent within the Russian Orthodox Church in Britain. It was decided that the new community would be dedicated to the Holy Martyr Grand Duchess Elizabeth, one of the most venerated saints in Russia. It was very appropriate that St Elizabeth was chosen as the principle patron saint of the Sisterhood. She was closely connected with this country and its Royal House all her life. Losing her mother when very young, she was brought up by her grandmother Queen Victoria, and was deeply attached to her. In her early years Ella often lived in the South of England – particularly at the Queen’s Isle of Wight palace, Osborne House. After marrying the Russian Grand Duke Sergey and moving to Russia, she visited Britain on a number of occasions. Later, when she was the head of The Martha and Mary convent in Moscow, she visited some Anglican convents to see examples of charitable work there. The first major church celebration at Rocks farm took place on 18 July on the feast of the Holy Martyr Elizabeth and of St Sergius of Radonezh, the patron saint of Russian monasticism. It was attended by pilgrims from London and guests from the village of Bodiam. Thus began the missionary work of the community. In February 2007, on the day of commemoration of the New Martyrs and Confessors of Russia, with the blessing of Bishop (now Archbishop) Elisey, the community received these Martyrs as its second dedication and, as a consequence, a multitude of new intercessors with the Lord. In 2006 nun Martha (sister Feodosia at that time) from The Holy Trinity and Saint Stephen Convent near Alexandrov, took up residence at Rocks farm. A temporary chapel was established on the ground floor of the Farm House, with the kitchen and refectory ("trapeznaya") located in the same open space. On the first floor the former family bedrooms were converted into cells for future residents and pilgrims. The farm was purchased with substantial agricultural land and buildings attached to it. This was regarded as favourable for the monastic community’s future development, although it involved a lot of immediate attention from the nun and her helpers. Thanks to many pilgrims and local Orthodox, the land was cultivated intensively for growing vegetables and fruit and for chicken farming. The building work still remains unfinished. Newly built items include a separate kitchen and a residential annex for visiting priests, a new entrance hall and a vegetable storage room. The garden was embellished with hundreds of flowers, rose bushes and trees. For all these developments we have to be grateful to our generous sponsors who helped to acquire this place and continue supporting our Community and all its developments. The last and most important project is the conversion of the swimming pool into a spacious church. On the 10th of September 2010, after four years of community building and monastic prayer, the Sisterhood of the Holy Martyr Grand Duchess Elizabeth and New Martyrs and Confessors of Russia was officially established by Decree of the Diocesan Council. Nun Martha was appointed as Head sister, which was a first step towards establishing a convent. Due to different circumstances it still remains a settlement of only one nun. Nevertheless, around this nun and a number of enthusiastic priests the Community of Orthodox people was established and it has been growing every year. From the year 2010 the Community was also given the status of Hierarchical Metochion, which means a Residence of the Archbishop of the Sourozh Diocese.